Duodenal switch surgery is the most effective Bariatric surgery currently performed for total weight loss and control of diabetes. It is not the most common procedure performed however due to its complexity and risk of complications. The operation begins with Gastric Sleeve Surgery. In fact, the Vertical Sleeve Procedure was initially performed as a first stage of this operation with the intent of performing a second stage later. The investigators found that in many cases, the weight loss was good enough with Gastric Sleeve surgery alone that they did not have to complete the second part. The second part of the procedure requires that the gallbladder be removed, then the small intestine is divided just beyond the end of stomach. The small intestine is then measured a specific distance from its connection to the large intestine and divided. The lower end is attached to the bottom of the stomach sleeve. The upper piece is attached to the small intestine at a predetermined length upstream from the connection of the large and small intestine. If it sounds complicated, it is. Duodenal Switch Surgery is VERY effective for weight loss and diabetes control but because of its possible severe side effects is not offered by most surgeons. The complications can be severe. They usually involve poor absorption of vitamins and nutrients. As in all Bariatric surgery procedures, there is no guarantee that the weight loss will last forever. 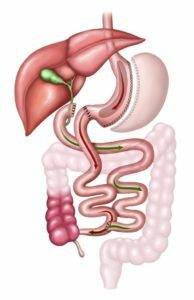 Most Bariatric surgeons currently offer Gastric Bypass surgery instead of Duodenal Switch because the weight loss is similar, but the risk of long term complications much smaller. The NJ Bariatric Institute does not currently offer Duodenal Switch Surgery.